A Carson 3D ED vs Zen-Ray ZRS HD comparison would not have seemed likely during 2012. We had been pleasantly surprised by the quality of the Carson when we reviewed it first. At that time, it was selling at a higher price and we included it in the 2012 best binoculars as best in that higher price range. We had purchased a 10X42 3D ED to test initially. During 2013 we bought an 8X42 with the idea of comparing it to other, higher-priced binoculars (which we had purchased in 8X configurations) to see how they compared. While we could mathematically arrive at comparative figures for 8X and 10X performances, for example, we thought that the differences might be small enough that it would be good to actually compare apples to apples. 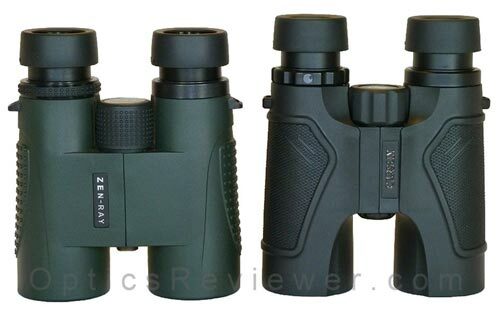 During 2013, we decided to venture on another binocular that was establishing a reputation for quality optics at reasonable prices. When we tested the Zen-Ray ZRS HD, we were quite favorably impressed with its performance at a price that was lower than the Carson 3D ED binocular's price had been when we reviewed it during 2012. In preparing the 2013 Best Binoculars list, however, we realized that the 2013 economy had produced a number of changes in prices for binoculars. A number of models in various brands had what seemed to us to be significant price reductions. Given these changes, the Carson 3D ED and Zen-Ray ZRS HD binoculars are very close in price at the time this article is written. Not only are they close in price, but they enjoy certain similarities in optical quality. When confronted with this, we decided to make our new Carson's first comparison with the Zen-Ray. Both binoculars are a delight to use — would one have an edge over the other in optical performance? Our regular readers are likely anticipating what's coming next, so we'll not disappoint them. It's only fair to warn you that when we write a comparison article, you may be cheated out of significant enjoyment if you base a binocular purchase on only a comparison article! We only present the information that's relevant to the comparison here. 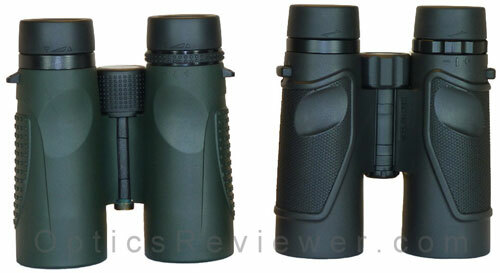 Other, more detailed information, that might influence your choice, is in the individual review for each binocular. Given that the Carson entered the market with a higher price, one might reasonably expect it to turn in a bit better performance. We'll start the Carson 3D ED vs Zen-Ray ZRS HD comparison now…. The fit and finish on both binoculars is good. The physical points that a person would expect to be functioning well are doing so. The point on this element would likely go to Zen-Ray for having a magnesium frame. Our optical technician friends would vote that direction, they tell us, because binoculars with metal frames are easier to work on. The Carson's frame is polycarbonate. What difference does the chassis' material make in the binoculars' weight? The Carson is 0.6oz (17g) lighter than the Zen-Ray binocular. Is the weight difference enough to sway a person's preference? We doubt it. The eyecups on both these binoculars feel solid and have smooth twist-in and twist-out action. The Zen-Ray has an intermediate detent. The Carson is either fully-extended or fully-collapsed. We didn't find that we missed an intermediate step with the Carson, although we did use it from time to time with the Zen-Ray. Depending on the configuration selected, the Carson's eye relief is either 0.5 or 1.9mm greater than the Zen-Ray's, per their published specifications. For our eyeglass-wearing friends, you'll want to be familiar with your eye relief needs so as to know whether or not the differences might affect you. The Carson 3D ED's focus felt solid and didn't have any "play" a person would notice when shifting directions on the focus wheel. While we didn't feel that it was a significant problem for the Zen-Ray ZRS HD, it does have a very small amount of "play" in the focus wheel. The speed of the focus adjustment is a bit faster for the Carson, at 1.25 revolutions from close focus to infinity, than the Zen-Ray's 1.50 revolutions. We probably have an earned reputation for pushing for a faster focus. We do like 1.25 as compared to 1.50. While it's not a major thing, if we were to choose between the two binoculars strictly on the basis of the focus adjustment, we would likely go with the Carson's focusing. While there isn't any question about the build's importance, this is where we tend to be a bit more interested in any differences between binoculars. The Zen-Ray 8X42 has a 393ft (125m) field of view as compared to the Carson's 341ft (114m) field of view per their specifications. As noted in our individual review for the Zen-Ray ZRS HD, we found that it had a good, sharply resolved sweet spot to about 50&percnt; of the field of view's radius — at which point the fine lines and/or edges of thicker lines began to almost imperceptibly soften. It wasn't until about 72&percnt; of the radius that the details started to blur noticeably. When calculating the distinct and usable resolution areas of each models' field of view, it appears that the Carson has an edge of about 40ft (12.2m) over the Zen-Ray's field of view. When comparing the fields of view before they become noticeably blurred, it appears the difference between the two binoculars is not likely to be significant to most people. We like large fields of view, there's no question about it. In this situation, we're torn between the usable and the larger view where even being able to notice movement, whether blurred or not, is of benefit. When viewing images, we felt that the Carson's optics provided better resolution of details. This is to be expected since it has extra-low dispersion (ED) glass which tends to enhance resolution by reducing chromatic aberration. To have both dielectric prism coatings and ED glass would seem to give the 3D ED a decided advantage in resolution of details — something that's somewhat unusual at the price point at the time of this writing. It is reasonable to expect that the Carson 3D ED have less color fringing (chromatic aberration) because of the ED glass used in its objective lenses. It does do well in this regard and, while the Zen-Ray is good, the Carson pulls ahead in this area of testing. Because the Carson's excellent light transmitting qualities earned our appreciation when we reviewed it during 2012, we were wondering how the Zen-Ray ZRS HD would do in this area against the Carson. We were pleasantly surprised to find that a side-by-side comparison of the Carson and Zen-Ray binoculars in very low lighting did not show one to be significantly better. Mind you that comparison was with our naked eyes, which don't produce the same results as sensitive test equipment can produce. The Zen-Ray ZRS HD and Carson 3D ED are about the same in their ability to handle strong light. We didn't notice that one had a distinct advantage over the other. We mention this despite our having committment to discuss those things that differ between two binoculars simply because this can be such an important area for many binocular users. While both the Zen-Ray and the Carson have good depth of view or "depth of focus," we felt the Carson enabled us to switch viewing distances without significant focus adjustment to a greater degree than the Zen-Ray. Both of these binoculars are terrific values and show that a lot of thought and appreciation for the user's interest went into their design. As long as these two binoculars are nearly the same in price (as they are while this article is being written), we would have to go with the Carson 3D ED as providing an enviable optical performance. If the Carson's price goes back up, of course, one would likely see the favor tip significantly to the Zen-Ray ZRS HD at its price point. To be well-informed on each of these binoculars, please read the individual reviews for the Zen-Ray ZRS HD and Carson 3D ED if you've not already done so.